An educator in the Teaching in the Fast Lane gets up close to an Iowa DOT bridge. The demand for students educated in STEM fields continues to grow. Many sectors of American society need more men and women with degrees in science, technology, engineering, or mathematics, including transportation. This workshop, funded by the Iowa DOT, was held at InTrans. Twelve high school and middle school teachers (who reach nearly 1,200 students) attended, participating in the creation of transportation-related activities such as yellow light timing and runaway truck ramps. The activities helped bring STEM into the teachers’ classrooms and after-school programs. Nineteen high school students from classrooms across Iowa came to InTrans for a week of leadership training and team-building, which included traversing a rope climbing obstacle course. Participants were also able to “test drive” the MiniCym—a driving simulator that allowed them to respond to various obstacles and hazards. Students were able to see what a snow plow operator really does by “driving” in a snow plow simulator housed at the Iowa DOT. And they learned the true value of leadership by “giving forward” as volunteers at a local area food pantry. Two dozen elementary teachers participated in activities based on the American Association of State Highway and Transportation Officials’ Roadways in Developing Elemen­tary Students kit. 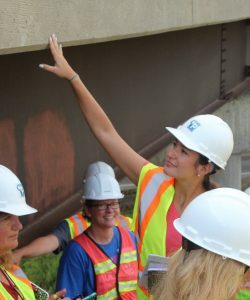 Teachers also visited actual bridge testing sites and heard from visiting Iowa DOT and InTrans speak­ers on the importance of an engineering education. The summer educational workshops helped reach teachers, some of whom were unsure how to include engineering topics in their classrooms. Daniel Loy, a fourth-grade math and science teacher from Beaver Creek Elementary in John­ston, Iowa, was one of those educators until he attended the Teaching in the Fast Lane Workshop. The MTC also sponsors Go! magazine, a free online pub­lication for teens and young adults that explores the world of transportation and transportation-related careers. The publication’s goal is to develop the transportation workforce by educating and stimulating young minds about the vast educational and career possibilities in transportation. Go! (www.go-explore-trans.org) offers entertaining and infor­mative articles, a database of transportation careers and edu­cational opportunities, and links to other resources. Go! has a companion Spanish e-zine, ¡Vamos! (www.vamos-explora-trans.org). The publications’ major sponsors are InTrans, the MTC, and the Federal Highway Administration. The Iowa Department of Transportation and Iowa State Uni­versity’s Institute for Transportation joined forces with the Science Center of Iowa to sponsor the first “Ready. Set. Build! Bridge-Building Challenge,” an event to inspire future engineers to “build” their dreams. Participants learned about bridge construction topics like struc­tural efficiency working in a team. Held in Des Moines on November 7, 2015 at the Science Center, the competition consisted of 24 teams and 75 participants. Groups of two to four participants and even families had three hours to design and build their own bridge using balsa wood, wooden clothespins, ice cream sticks, hot glue, and string. The members of Bumble Squirt, an all-girl team from Eason Elementary (see below) in Waukee, Iowa, said that their success was only possible because they worked together and just had fun. “We learned so much! Like that a triangle is the strongest shape,” said one team member. Bumble Squirt’s hard work paid off because they took home the award for Highest Structural Efficiency within their age group, with a bridge holding 73 pounds. Another all-girl team, the Pink Fluffy Unicorns from Adel-Desoto-Minburn Middle School in Adel, Iowa, was one of the only teams to utilize string in an attempt to make suspensions for their bridge. They took home the award for Truss Teamwork.